In an effort to bring visual and performing arts into the large public areas in Los Angeles World Airports, LAX is now presenting live music in terminals in conjunction with the art exhibitions that have been running for more than a decade. LAX, the fourth busiest airport in the world, provides the ideal campus for the Department of Cultural Affairs to display local artists’ work. Airport Art Manager Sarah Cifarelli explains that current displays include performances in terminal one, three display cases in terminal three and more two-dimensional artwork in terminals one, three, six, seven, eight and Tom Bradley International Terminal. The exhibits are installed with the help of the Department of Cultural Affairs during the night and stay up for six months and sometimes for two to three years. 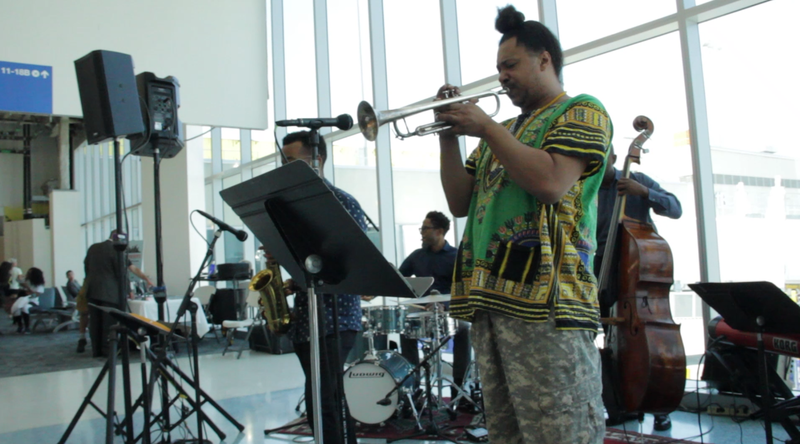 Through a partnership with Grand Performances, LAX Presents allows artists like The Bronzeville Union to perform in front of large audiences. Dexter Story, The Bronzeville Union’s composer and drummer explains that performing helps him see people from a special perspective. “I think the opportunity is to kind of see everyone as one in a sense and see the humanity in everyone,” Story said.